Christmas greetings from Florida! What is Christmas in Florida like? 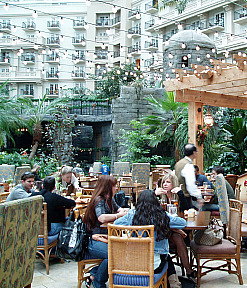 I spent many Christmas in Orlando and for years I have heard what a great buffet that the Orlando Gaylord Palms Hotel serves at their Villa De Flora Restaurant. My friends who travel in different parts of the world have told me that it was tops. I have made reservations several times but with my busy schedule, something always came up. Recently, when I heard about the ICE show, Kelly and I decided to cancel everything and head to Orlando. In Orlando we met up with our friend, Anna Mae and continued on to Gaylord Palms. Upon our arrival at the Villa De Flora Restaurant we were greeted in a warm friendly manner by JR, the manager. He gave us a tour of the buffet areas and went over all the great Christmas buffet recipes pointing out all the specialty items. 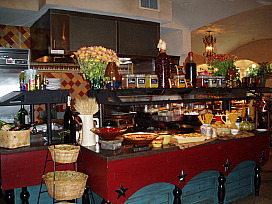 This restaurant is set in a European style market. 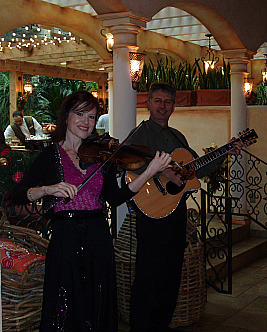 If you are spending Christmas in Florida at or near Gaylord Palms visit the Villa De Flora Restaurant for the buffet. On any day of the week you will find a “Bread Market” with European or specifically Italian baskets filled with various breads such as pita, focaccia, sour dough, rolls, and baguettes. Also at this market are cheeses, spreads,antipasto salads, and olives which go well with the delicious breads and pastries. 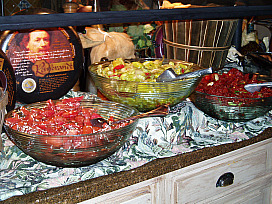 At the “Produce Market” you will find a fresh salad selection. At the “International Market” emphasis is placed on flavors from the country of the day like German recipes in the entrées and accompanying side dishes. The “Specialty Market” offers choice soups for the day, specialty dishes like prime rib, seafood dishes or roast turkey; all with accompanying condiments. The “performer’s Market” is items created by the chef to your satisfaction like special pasta dishes. Saving the best for last (by my judgment) is the “Sweet Shop”. This area is full of delicious desserts, like tiramisu, tress leches, chocolate dessert recipes, bread pudding, cheesecakes, holiday pie recipes and ice cream. How good can Christmas in Florida get! On Mondays and Fridays an Italian menu is featured. On Thursday it is Greek, On Wednesdays and Sundays France is celebrated and on Tuesdays and Saturdays Spain is featured. This is wonderful for guests who are staying at the Gaylord Palms. 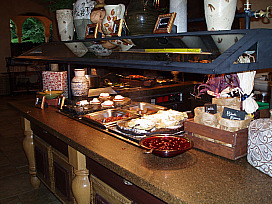 They can “eat their way around the world” at the buffet at Villa De Flora. I had already decided this was good start for our Christmas in Florida. As one who has always favored preparing buffets for guests, especially when I am cooking for a crowd, I do appreciate a “good one” when I eat out. When I dine out, I rarely eat at a buffet. 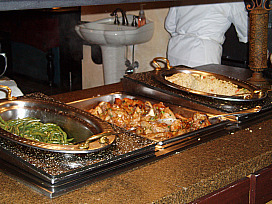 A buffet requires special knowledge in what types of foods go well in a buffet. These foods need to hold up to the time. Special attention must be given to keeping them either cold or hot. Special attention must be given to keeping the buffet neat and clean. The staff at the Villa De Flora Restaurant in Gaylord Palms deserves a lot of credit for their buffet. After looking over all the buffet area, JR showed us to a table. On each table is a pot of herbs. These herbs can be clipped and added to your meal if you like. Otherwise they make a great ornament and addition to the tables. As we sat down at our table, our waitress Shelly introduced herself. She reviewed with us the drink and wine list of traditional Mediterranean fare. Shelly brought us all a taste of Sangria. Now I am not much of an alcohol connoisseur but this was delicious. This is a traditional drink of Spain. It is made with fruit juices, brandy and either red or white wine. It is a pretty presentation with chunks of apple, orange, lemon and cinnamon sticks. 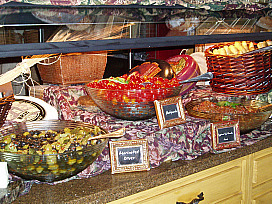 We all filled our plates with breads, antipasti and spreads on our first trip to the buffet. I couldn’t wait to try the eggplant spread and it was the best that I have had. Two more members of the staff came over and it was a privilege to meet Chris and David. As we sampled more of our plates from the “Bread Market” we discussed the selections and Christmas in Florida with our new friends. On my next trip up I tried to take little samples of many different items. I had baked cod, chicken, green beans, potatoes and various salads. I cannot tell you what Kelly and Anna Mae selected but we all agreed that everything was flavorful and very good. Running low on time, we made one last trip up and that was for the desserts. By now I was so full that I didn’t think I could handle any dessert. One look at the table changed that idea! I had to try the tiramisu and it was delicious. I noticed Kelly couldn’t pass up the pieces of chocolate cake soaked with chocolate liqueur. Our buffet meal at the Gaylord Palms was a great beginning to Christmas in Florida. The food at this buffet was kept fresh and very presentable throughout the day. I was so happy to finally eat here after hearing so many good reports for so long. It was everything that I had heard it would be. It was hard to believe that we spent so much time there eating. We did have a lot of interesting conversation mostly about “food” with the very nice staff. All three of us do appreciate the delicious food and the great service. Thank you JR, Shelly, Chris and David. 5 Cups cooked eggplant (Bake at 350F degrees until tender; cool, peel, open, remove seeds and chop by hand. 2 Medium plum tomatoes, peel, seed and chop by hand. In a food processor chop into small pieces the onion, green pepper, basil, garlic, jalapeno and olives. Combine the eggplant, tomatoes and chopped vegetables. Add the lemon juice, olive oil, bread crumbs, salt and pepper. Stir until thoroughly blended. Serve with warm pita. The following recipe is great for Christmas in Florida or for any other time! Mix together the Marsala and coffee mixture. Dip ½ ladyfingers in mixture and line an 8x8 inch pan. Combine sugar, cream, all eggs, flour and vanilla bean in a heavy saucepan. Cook, stirring constantly until thickened. (about 20 minutes) Cool and remove vanilla bean. Slowly beat in the cheese and coffee liqueur. Pour ½ of mixture over the ladyfingers. Soak remaining ladyfingers and layer; Cover with remaining ½ of cheese filling. Prepare topping below and cover cheese filling. Whip cream on high speed, gradually adding the sugar; Beat until peaks form. Spoon over the cheese/pudding mixture. Sift the cocoa powder over the top. Chill until it sets at least 2-3 hours. I hope you enjoy these recipes and this special edition newsletter. I will be sending out extras until after the holidays to show you what is happening at Christmas in Florida. If you want to have a buffet like I attended at the Gaylord Palms Hotel for Christmas in Florida, this recipe would make a nice addition to it. It also serves as a nice alternative to the traditional turkey and ham recipes. Score fat on pork roast at 1 inch intervals; place fat side up on rack in roaster pan. Insert meat thermometer through fat into center of roast; allow about 30 minutes per pound. To make sauce heat butter in saucepan; stir in brown sugar. Add orange concentrate and stir until smooth. Remove and reserve ¼ cup of sauce to baste roast during last 20 minutes of cooking time. Stir water into cornstarch; add gradually into remaining orange juice mixture. Cook stirring constantly until thickened (cook 8 minutes). Before serving stir in grapes and serve hot with pork. As I saw for Christmas in Florida, great buffets cannot have too much wonderful fresh baked bread. Try this one! Combine 1 ½ cups flour, ½ cup rye flour, yeast, sugar and salt in a large bowl. Combine milk, water and oil; add to flour mixture stirring until mixture is smooth. Stir in chopped onion and caraway seeds; gradually stir in remaining 1 cup rye flour. Add enough of the remaining all purpose flour to make soft dough. Turn onto floured surface and knead until smooth and elastic. Place in a well greased bowl and turn to grease top. Cover and let rise in a warm place about 1 hour or until doubled in bulk. Punch dough down; turn out onto lightly floured surface and knead lightly (5 or 6 times). Roll dough into a 7 X 14 inch rectangle; roll up dough starting at short side. Press firmly as you roll to eliminate air pockets; pinch ends to seal. Place dough seam side down in a well greased loaf pan. Combine egg, whipping cream and 2 teaspoons water in small bowl; brush loaf with mixture. Bake in preheated oven at 375F degrees for 35 minutes or until loaf sounds hollow when tapped. Remove bread from pan immediately and cool on rack.